With contributions from prestigious lawyers, economists, accountants, and consultants from around the world, Intellectual Property in the International Marketplace presents a highly complex subject in a user-friendly, organized manner. 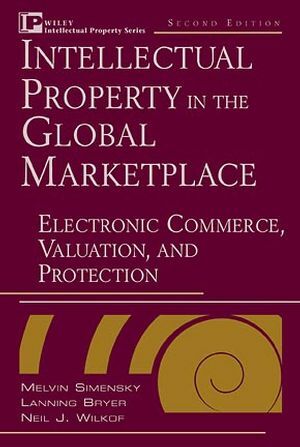 The two-volumes serve as an intellectual property compendium to business professionals and their counsel, helping them explore and answer intellectual property questions in business transactions in global settings. Volume I covers the methods for dealing with intellectual property in every type of business transaction, while Volume II covers the underlying general principles of international intellectual property law. The core volume (ISBN 0471-351059) is supplemented annually. * New chapters on such topics as Patent Strategies in the Era of the Internet, Parallel Imports into and within the European Union, and Copyright and E-Commerce. * Updates to International Laws and Developments on Security Interests in Intangible Assets that have taken place in Australia, Canada, France, Hong Kong, and Korea. The supplement updates the 2 Volume set, Simensky/Intellectual Property in the Global Marketplace, Second Edition (ISBN 0471-351059). 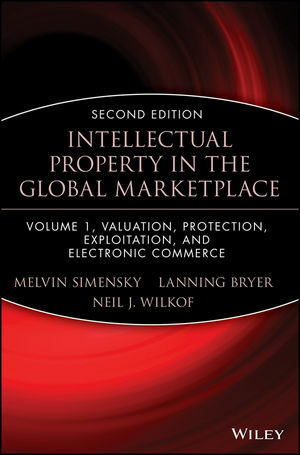 Melvin Simensky is the author of Intellectual Property in the Global Marketplace, 2nd Edition, 2 Volume Set, 2nd Edition, published by Wiley. Lanning G. Bryer is the author of Intellectual Property in the Global Marketplace, 2nd Edition, 2 Volume Set, 2nd Edition, published by Wiley. Overview: Intellectual Property -- The New Global Currency (C. Zimmerman). THE NEW MARKETPLACE: THE ROLE OF INTELLECTUAL PROPERTY IN ON-LINE COMMERCE. Trademarks and Domain Names (S. Weinberg). Trademark and Domain Names: International Perspective (D. Prahl). The Advent of Electronic Commerce: Intellectual Property, Banking, and Finance (R. Lamb & R. Rosen). Internet Industries Convergence: Legal, Strategic, and Global Concerns (R. Lamb & R. Rosen). Economic and Financial Issues in Intellectual Property (R. Lamb). Quantitative Methods of Valuing Intellectual Property (G. Smith & R. Parr). Intellectual Property: Proactive Auditing (N. Swycher). Financial Accounting and Reporting Considerations (A. Carter & M. Lasinski). Amortization of Intellectual Property for U.S. Federal Income Taxes (R. Gehan). The Rating Agency View of Intangible Assets (T. Hoens). Global Piracy and Financial Valuation of Intellectual Property (R. Lamb & R. Rosen). Imperative Strategies for Protecting Trademark Assets: The International Market (I. Kaufman & B. Bakshani). Certification Marks in the Competitive Commercial Environment (J. Belson). Parallel Imports Into and Within the European Union (S. Jackson & R. Kempner). Imperative Strategies for Protecting Intangible Assets: The U.S. Market (A. Daniel). The GATT Copyright Restoration: A Loss for the Public Domain for the Benefit of Trade Policy (A. Hartnick & N. Mertzel). New International Copyright Rules: The WIPO Copyright Treaty (T. Vinje). Trends in the Protection of Intellectual PropertyRights: A Case Study from Ghana (P. Kuruk). Current State of Protection of Intellectual Property Rights of the Former Soviet Union (M. Eliseeva). The Intellectual Property Characteristics of a Generic Company (A. Cohen). Some Practical Applications of Brand Valuation to Corporate Trademark Management (S. Getzoff). The Insurance and Management of Intellectual Property Risks (M. Simensky & E. Osterberg).